A Levine family thing, well mine, was when asked what I wanted for a gift. Cleverly I strategized a means to get many gifts; I would request “A big box full of a whole bunch of little toys.” My parents always obliged. The calendar and later in the day my older system reminded me that yesterday would have been my Dad’s 92nd birthday. Morris a.k.a Mike a.k.a Blackie a.k.a Mickey a.k.a Dad. I joked to Judy that he would likely still have his full set of dark hair. We laughed about his obsession dedication to lawn care. Seventeen years ago, in May 2001, I went to Florida for his 75th birthday, the last, celebrated in the hospital as doctors were unable to do much about the mass of cancer enveloping his stomach. While organizing stuff for my move I came across the Dad Box, a lot of it stuff my Mom mailed me after he passed away in August 2001. 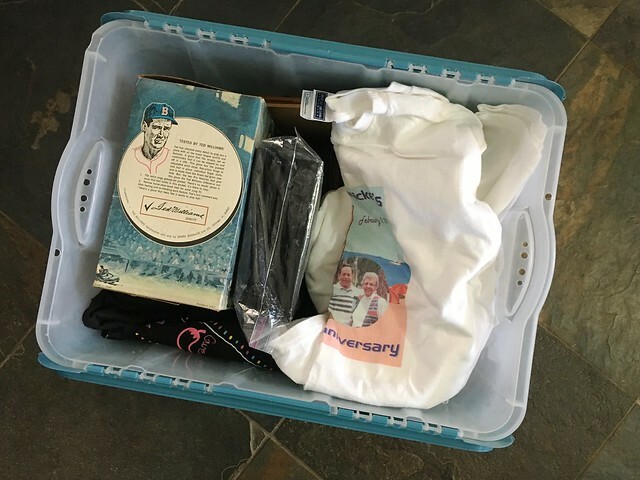 Opening the Dad Box- on the right are t-shirts from my parent’s 50th Wedding anniversary in 2000. 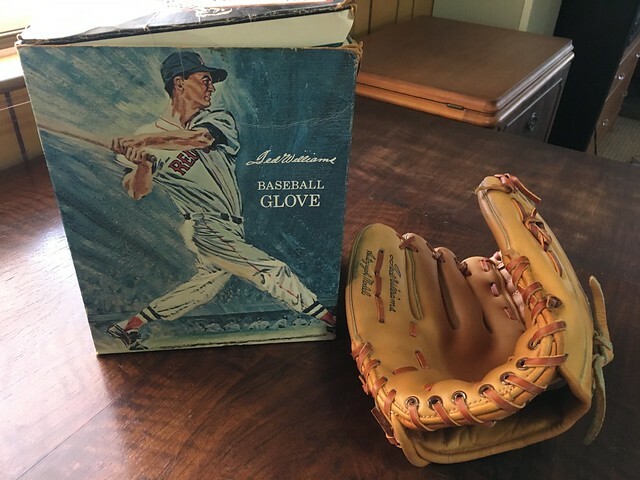 This baseball glove was not his childhood one (look at the condition) but the one he bought to play catch with me when I was in little league (2 dismal years in the minors). I forgot he was a lefty! My smile is seeing how he kept the original box that the glove came in; in getting my stuff ready to move I find I do the same thing. On the back of the glove is a level of organization I don’t reach. 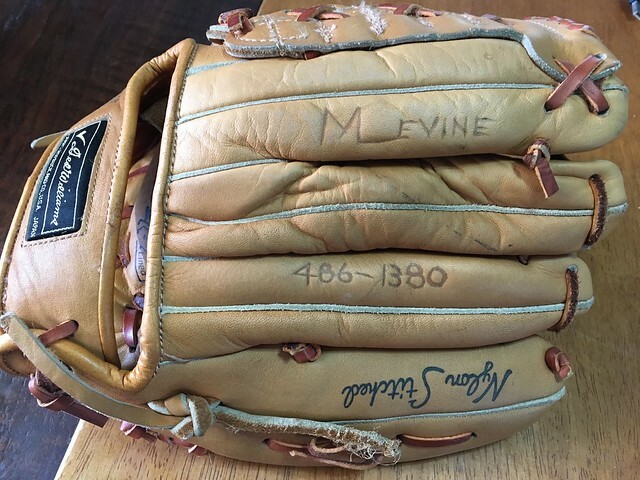 He used a wood burning tool to put his name and phone number on the glove. There was a neighborhood story where I mistakenly took home some other kids bat, and my Dad etched my initials in it. Sorry Dad, you exceed me here on the level of personalization! 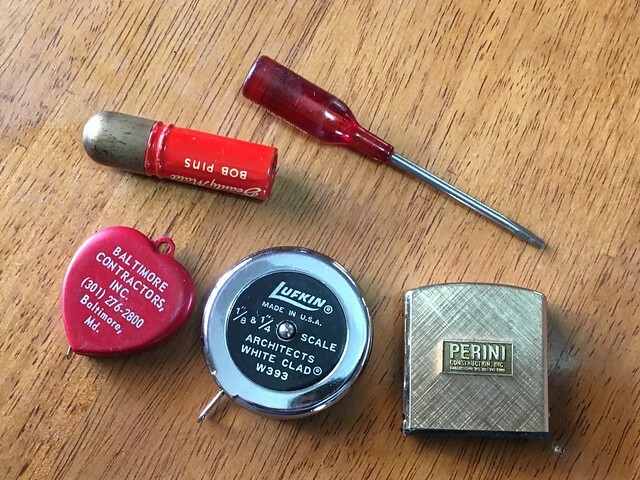 There are many little tools and tape measures and other remnants of my Dad’s years working as a bricklayer and other jobs for Baltimore Contractors, the company his dad was a major force in the 1940s. Even more bits of Dad stuff, his ID bracelet, an old toy, a pocket knife. There’s something reassuring in just holding these items in my hand. 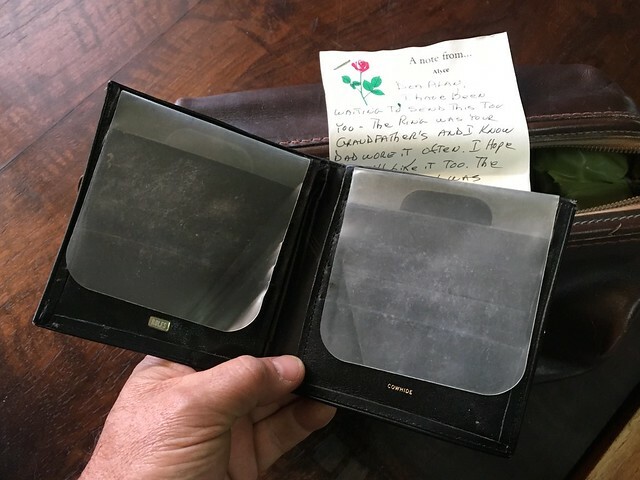 My mom sent after his death many things including his last wallet, here empty. Yeah, metaphors galore. 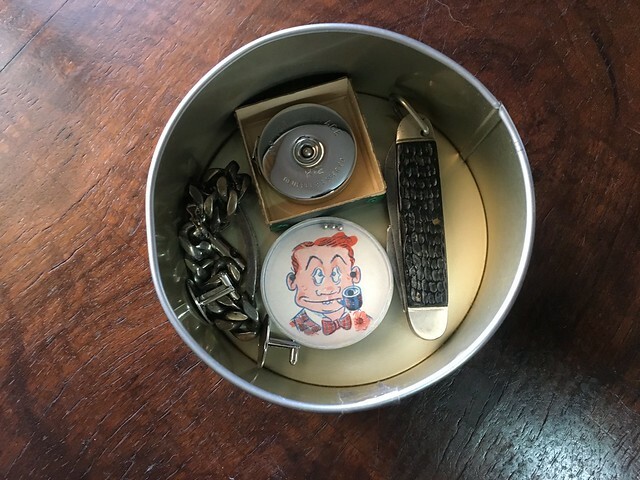 There is also his old leather shaving kit. And the note from my Mom explaining every item. Look at how my Mom annotated everything with a note. 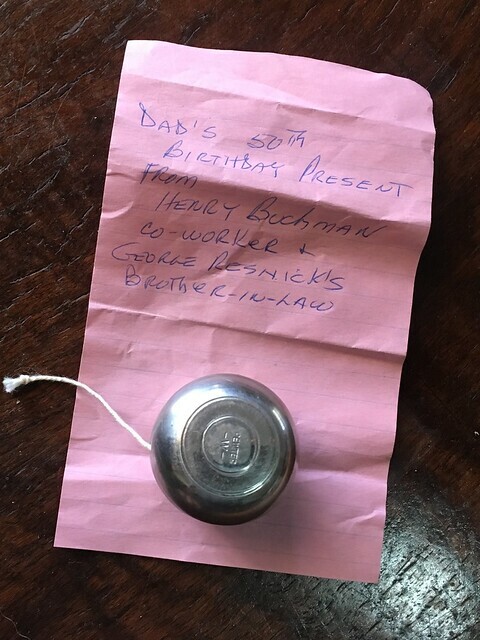 This silver yo-yo was a 50th birthday gift from a long time friend, names like Henry Buchman and George Resnick I can conjure as very foggy memories. 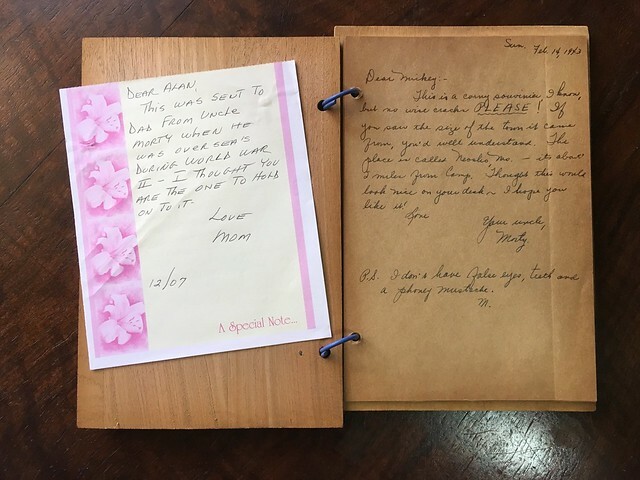 Last item, this wooden covered notepad from my Dad’s Uncle, my Great Uncle Morty sent to my Dad during World War II. The cover has an eagle and the place name Neosho, Missouri which was the location of Fort Crowder, a training center my great uncle likely spent time at before going overseas. I vaguely recall that Uncle Morty has language skills and he spent his time doing translation work (?? I am not sure I hope my sisters remember better). Dear Mickey. This is a corner souvenir, but no wisecracks, PLEASE! If you saw the size of the town it came from, you’d well understand. The place is called Neosho, Mo- it’s about 2 miles from camp. P.S. I don’t have false eyes, teeth, and a phony mustache. My dad would have been only 17 in 1943; his uncle training in an army camp, was 19. I love the playful talk, hard to imagine your parents and uncles joking like teens. I have no idea what the wisecracks are nor the reference in the P.S., but it warms me to think of the man I know as Dad as just some kid. I got a big box of little big memories, and a lifetime plus of love. Happy Birthday, Dad… I miss you. Featured Image: Dad and me in 1994. My photo. You can use it too. Why? I dunno. But everything I do here is licensed CC-BY. Very cool! I like Mom’s notes. Love seeing our old phone number on the glove!